“Nutrient dense” is a term that gets thrown around a lot in plant based eating circles. 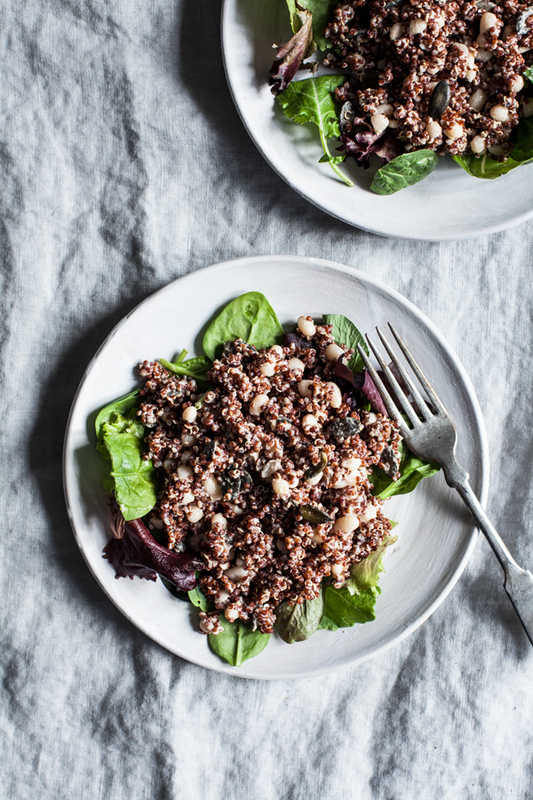 This red quinoa, pumpkin seed, and tahini salad is a great example of a dish that’s nutrient dense on many fronts–not to mention tasty, quick, and versatile. Have you see the “ANDI” ratings at Whole Foods? That system is centered on the idea of nutrient density, but it’s particularly focused on the ratio of nutrients to calories. Foods that provide more nutrients with less calories get higher ratings, and vice versa. My own idea of a nutrient dense recipe or food is simply something that provides a lot of nutrition in one place. This might mean micronutrients, like vitamins, phytonutrients and minerals, or it might mean macronutrients, including protein, fat, and carbohydrates. Thankfully, so many plant foods offer both micro- and macronutrient density in one healthy package. Take beans, for instance: not only a source of complex carbs and protein, but also packed with calcium, iron, and numerous vitamins. Or avocado: both brimming with healthy fat, and rich in fiber, Vitamin K, Vitamin C, Folate, Vitamin B5, and potassium. 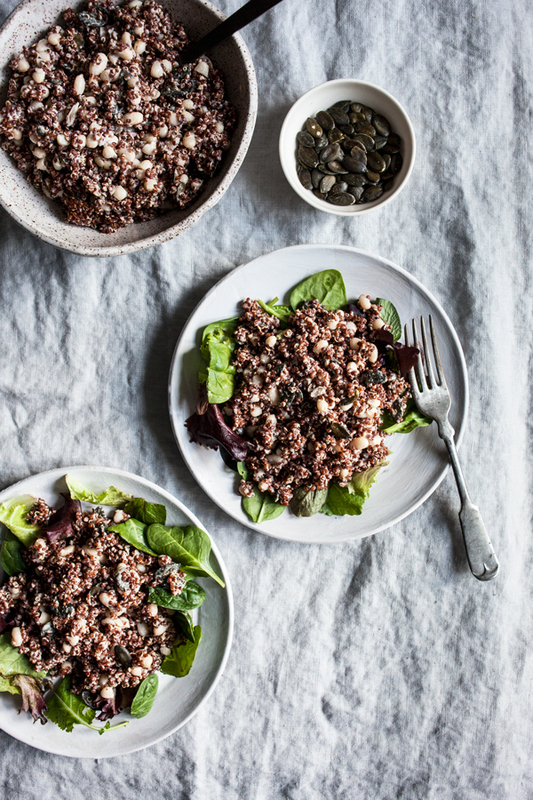 This grain, seed, and legume salad embodies plant-based nutrient density at its finest. 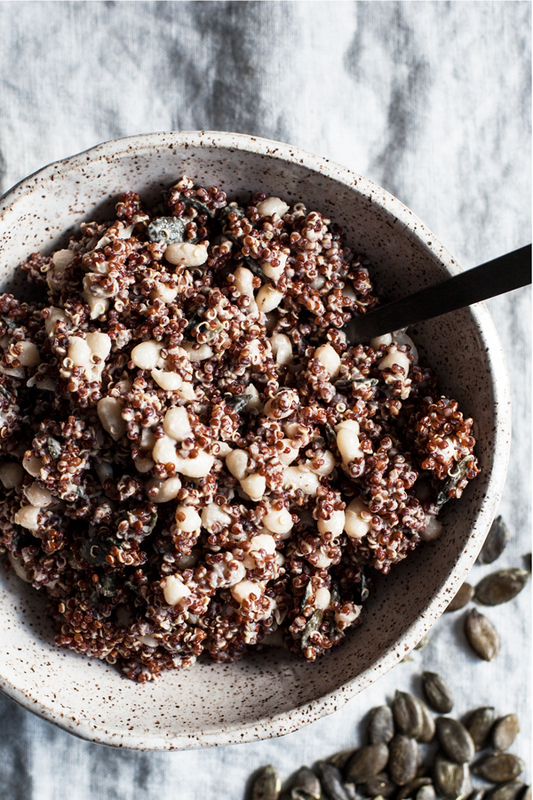 It’s rich in healthful fat, thanks to the tahini and pumpkin seeds, as well as both protein and carbs, thanks to navy beans and red quinoa. The pumpkin seeds provide phosphorus and zinc, while the quinoa is rich in folate. Both navy beans and pumpkin seeds are a good source of iron. And all of the main ingredients are rich in fiber. You can scoop this salad over fresh greens and dig in. 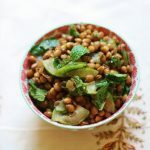 You can also serve it with toast, with sautéed leafy greens, or with a hot cup of soup. This recipe came together at a moment’s notice: I’d just gotten back from traveling and had to throw together dinner with nothing but what was in my pantry. As usual, I had canned legumes, pumpkin seeds, tahini, and quinoa, and that’s really all it takes to make a hearty, satisfying dish. Rinse the quinoa through a fine sieve. Add the quinoa and 2 cups water to a medium sized saucepan. Bring the water to a boil. Reduce the heat to low, cover, and simmer for 15 minutes. Remove the quinoa from heat, fluff gently with a fork, and re-cover. Allow it to steam for 5 minutes. Whisk together the tahini, salt, lemon juice, water, garlic, and ginger and/or sesame oil, if using. Mix the quinoa, beans, and pumpkin seeds together in a large mixing bowl. Pour the dressing over the salad ingredients. Mix well and serve as desired. Leftover salad will keep for up to 3 days in an airtight container in the fridge. I’ll see you back here tomorrow. And before I go, a quick note to thank you for a fantastic discussion yesterday! I’ve been meaning to write about supplementation and veganism for a long time, and I’m so happy that it seems to have been on other people’s minds, too. Images for this recipe were updated in January 2017. Previous Post: « DHA in Vegan Diets. Is Supplementation Necessary? Plus, True Vitality Protein Powder (DHA Enriched) Product Review. pumpkin seeds…tis the season! Great way to put them to use, and with tahini. YUM! Nutrient density, not a big deal in my book. I eat food that feels good, looks good–& to me this means plants, lots of ’em! I don’t eat a particular food just because it’s nutrient dense. I eat it because it’s delicious & satisfying. I suppose my definition of delicious & satisfying is different now than it used to be in my egg/cheese/icecream/meat days, but nevertheless, the fact remains: blueberries are delicious (& nutrient dense). Quinoa, kale, kidney beans. All foods I want to eat (& happen to be chock full of nutrients). I think nutrient dense is a term more for people who aren’t plant-based &/or into healthy eating–it’s a way for them to decifer what’s “good,” what’s not. Gena, I hate to be critical, but this sentence, “The brilliance of plant based foods is that they often offer us both the micronutrients of which meat and dairy are essentially devoid, and plenty of healthy sources of fat, protein, and carbohydrates, too,” is not accurate. Meat and dairy from pastured animals, fish, and eggs, are RICH in micronutrients. They may not stack up to fruits and vegetables, but in terms of nutrients per calorie, they are FAR superior to grains and legumes. There are, of course, PLENTY of reasons NOT to be eating those foods, reasons you’ve outlined in numerous eloquent blog posts. But you make a more compelling case for veganism when you stick to the facts. Grains and legumes are not as rich in micronutrients (or even macronutrients if you’re looking for protein) as animal products, but they are superior option for numerous ethical reasons (and maybe a few health reasons, if you buy the argument that all those vitamins and minerals in the animal products come in a less than healthy package). I know how committed you are to veganism, but just try plugging 1 egg into a nutrient calculator and compare it with 80 calories of legumes. Or 3 oz of grass fed beef. Or raw Swiss cheese. Or goat kefir. Or wild salmon. Or clams. Mind you, I don’t consume those things. But they are some mighty nutrient dense foods. If you’re going to argue that grains and legumes are superior, you can’t argue on basis of nutrient density. That’s a fair criticism, Elizabeth! More than fair, as I was being grossly innacurate in how I worded that. But I didn’t mean to twist facts for an agenda, or be deceptive. I’m tired, and as I was writing that, my mind went to phytonutrients like antioxidants (often celebrated as the “nutrients” in nutrient dense vegan food). Of course beef and dairy contain vitamins and minerals. I’m editing now. But again, that was accidental, not intentionally deceitful. As you know, I don’t tend to purposefully overstate health benefits of veganism. I didn’t think you were being deceitful! And I certainly wasn’t disputing the amazing nutritional properties of raw fruits and vegetables! I think if 80% of what you’re eating (by volume) is raw fruits and vegetables, the other 20% doesn’t matter much, from a health perspective. Whether you’re eating rice and beans or meat, fish, and eggs. So I don’t really worry that chickpeas aren’t as nutrient dense as meat or that raw chocolate isn’t as nutrient dense as raw cheese or that raw nuts are so high in omega 6, etc. That 20% is all about calories for me, and while, no, I won’t be eating anything from your average bakery, and I’m making pretty healthy choices overall, I don’t fret over nutrient density. Because in all fairness, if I were really concerned with maxing out micronutrients, I’d get better numbers substituting animal products for legumes and raw desserts in my own diet (I don’t eat grains anyway). Elizabeth, I’ll buy your casual argument that “all those vitamins and minerals in the animal products come in a less than healthy package.” Last time I checked, it was meat consumption that was associated with increased risk for diabetes, CVD, certain cancers, shorten lifespan, etc., not legumes and grains. Sounds like those micronutrients may come with a price, eh? I think we need to be cautious in labeling meats and dairy as nutrient-dense, without considering all practicalities in actual consumption, and that a large population aren’t shopping at Whole Foods’s deli counter. The “superior” micronutrients in meat and dairy may be lost in the consideration of cholesterol, saturated fats, preservatives such as nitrates, hormones, antibiotics, combining meat with dairy, and high-temperature cooking. I think it’s fine to argue meats and dairy offer some nutrients. But origin, preservation, and food preparation play a large factor in these animal-based nutrients retaining all their “superior” values, their highly touted nutrient density. What good is a food that is nutrient-dense, if my body can’t optimize on those nutrients? And isn’t that the point? Jocelyn, you make a VERY good point, one I’ve made myself on numerous occasions while criticizing Westin A. Price, Paleo, etc. I care very, very deeply about where my food comes from, and what kinds of practices, industrial and otherwise, I am supporting with my food dollars. I do happen to believe animal products, when properly sources (I’m talking about meat, eggs, raw dairy from pastured animals) are more nutrient dense than grains or legumes; neverthless, I would never argue, as WAPFers do, that those items are necessary, as I’d rather see people eating a vegan diet and supplementing appropriately than supporting factory farming. The problem with the WAPF/Paleo argument, even if the folks advocating the diets are making conscious food choies, is that it encourages compromises on part of people who can’t afford the ethical options (because people who follow those diets think they need meat, eggs, etc. which of of course they don’t). Thanks, Jenny, for pointing out that we have to be careful about sourcing (and preparing!) plant foods as well. Especially corn and soy, staples of many vegan diets, which are almost always genetically modified. That said, I do agree that an ethical vegan diet is far more accessible than an ethical paleo diet – I’d never argue otherwise; I just wouldn’t call the vegan diet more nutrient dense, or healthier. Never knew there was a connection between meat consumption and diabetes; I always assumed the culprit was sugar. But I won’t argue it. I think in general vegans are more conscientious eaters than omnivores, which may skew the statistics. I am completely unconvinced by every argument I’ve every read that the (mindful) consumption of animal products is unhealthy. I might, however, be persuaded that eating animals is wrong. I’m not sure it’s wrong for everyone all of the time. But given where 90% of animal products in the US come from, I’d be willing to say it’s wrong for most of us most of the time. This sounds SO delicious!! I will HAVE to try this tomorrow! Thanks for posting! The lunch I take to work is something very similar–either quinoa or rice with chickpeas, veggies and Earth Balance (easy and doesn’t require me to use the office microwave/kitchen for more than a minute. Yay!) However, I have a bottle of tahini and a bunch of pumpkin seeds at home that I’ve been wondering what to do with. Bingo! I’m actually going to give this a shot. As for your question, I suppose that although my perception is skewed, I have always viewed my food choices through the “how is this nutritionally beneficial for me?” more than, “Wow, that just really sounds good.” That’s kind of why I have an issue with sweets and whatnot, as I can’t see the point in eating something that is simply devoid of nutrition (although it can be argued that even desserts have nutritional value.) I’m working on this balance, but for now, it’s always a factor in my decisions. P.S. I wish I lived by you. I would TOTALLY be your assistant/intern, paid solely in hummus, of course. Ugh. Sorry for the url typo. Carry on. This looks great! I have to find some red quinoa – I have quite a bit of the “regular” but the red looks like it would have a bit nuttier flavor. Beautiful recipe! Sometimes I get wrapped up in the idea of nutrient density, but I’ve found that a focus on eating mostly whole foods with some “treat foods” sprinkled in (Daiya cheese and dark chocolate are my big favorites) works better for me. At some points in my healing process I’ve gotten really wrapped up and fixated upon the nutrient profiles of various foods. It was an attempt to turn food into a positive force in my life, but it ended up missing so much of what’s really nourishing about the psychological experience of eating. Now I realize that what really helps me feel nourished isn’t the specific nutrient profile of the food itself, but the self-love and attention that I give myself during the process of preparing & eating a meal. Eating with minimal distraction is a big part of this for me. I’m still a health geek, and I love learning about food & nutrition. When it comes time to choose foods for myself, I tend to focus more on their energetic qualities (a la TCM—is it warming, cooling, drying, dampening? etc) rather than nutrient density. This new language has helped to set me free from the baggage that still lingers for me around calories, macronutrient ratios, and even micronutrients. And I also love to eat for pleasure’s sake; as I said in the recent dedication vs. obsession post, eating foods that have no obvious health benefit is a part of normalcy and recovery for me. That said, I do take a very engaged, active, and genuine interest in nutrition, and I do still love to ponder how the foods I eat nourish me. I also think that nutrient density can be an important tool for new vegans; I myself benefited a lot from thinking about it when I was switching from animal protein sources to plant foods. Oftentimes I would eat a big salad and wonder why I wasn’t full; the answer was that it was sometimes easy for me to forget to think about macronutrients (which is where my “meal sized salad” post came from). Bottom line is that there is a balance between nutrition awareness and pleasure, but both matter to me a lot! Very interesting on nutrient dense foods and I like Brandon’s term, “net gain”. 🙂 Learning about nutrients and getting more of them in foods versus consuming empty calories was a big motivator to me to adapt a high raw, plant-based diet. Thanks for the recipe, it looks fabulous! I have a habit of packing too much in whether it’s adding supplements, ‘superfoods’ or more ingredients. It’s a habit I need to break a little and relax! As much as I want every single meal to be jam-packed with nutrients, I don’t want to lose the sheer enjoyment of eating a delicious meal. This salad looks fantastic, I love the ingredients! I did something similar today with millet, black beans, avocado, zucchini, spinach and salsa. Perfect for on the go! Thanks for that “nutrient-dense 101”! I understood what it meant, but it’s nice to have more details all laid out for us like that. To me, nutrient dense meals allow me to pack the most nutritional punch with whole foods. 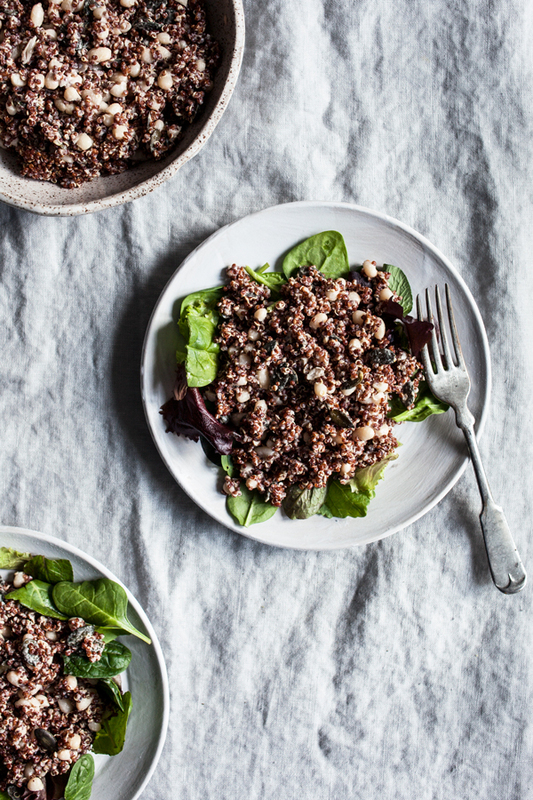 My favorite dish to achieve this is a quinoa pilaf with almonds, scallions, raisins, and a green (broccoli, kale or spinach), sometimes added edamame for more protein. I’ve made it for a lot of my meat-eating and vegetarian friends alike, and they love how tasty, healthy and satisfying it is to eat a bit from several food groups. It’s a geeky challenge, but I think it’s fun to see how many nutrients I can incorporate into a meal without relying processed, “vitamins added” foods. i feel like i consume mlot of foods with nutrient density but i wake up in the night and eat all the time! i started eating eggs thinking i was protien deficient and that hasnt helped to much i dont know what to do i feel like i eat so healthy all the time i even started adding more fats and now i feel like im gaining wieght i dont know if its the night eating or increase in fat comsumption what do you think? Just made this delicious dish. I didn’t have agave or maple syrup, but it turned out great anyway! Oh and I doubled it, I already knew I would love it!! Thanks for the simple recipes! Well, I guess I know what I am having for dinner tonight 😉 I LOVE quinoa/seed/bean bowls!